This article explains what each field is and does under the accounting tab in system setup. In the Accounting & Financial Data Collection section you can set whether you wish to export data to a 3rd-party accounting program. If you select to export to a 3rd-party package, select the desired package from the dropdown provided and enter your GL code extension. This extension is appended to the front of the GL code when exporting to a supported accounting package. Also in this section, you can set the Stock system & Financial year start dates. 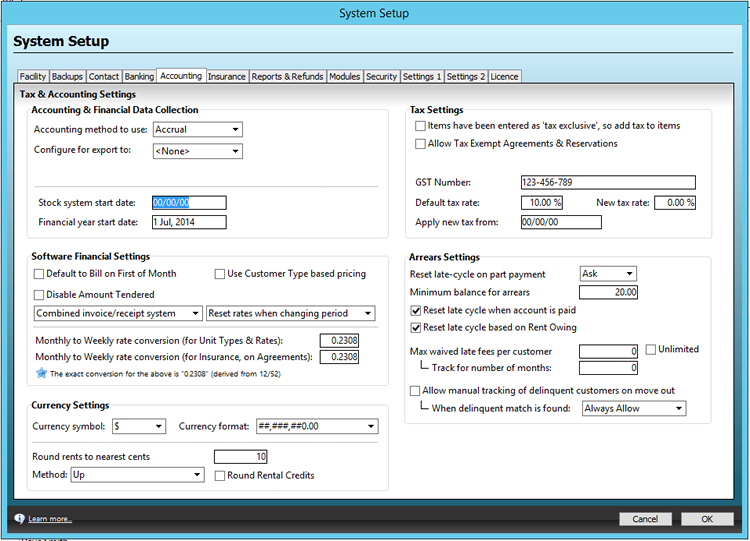 Within the Software Financial Settings section, you can set whether your business bills on the First of Month (as opposed to the Anniversary Date) and whether you wish to use Customer Type based pricing, the Amount Tendered option (which displays on most screens when you take a Cash payment), whether you wish to use other Invoicing & Statement Systems, and whether you wish to reset rates when changing period. Use the Weekly/Monthly Rate Conversion fields to specify how Storman should convert a monthly amount for rent or insurance to a weekly amount (as in, what multiplication should take place to reach the weekly figure). Note: The exact calculation is 0.2308 (this is derived from the following: 12 months divided by 52 weeks). Use the Currency Settings section to adjust your Currency symbol, Currency format and Rounding (rounding to the nearest cents) settings. In the Tax Settings section, you can set whether you wish to allow Tax Exempt Agreements & Reservations. When you enable this, a second option will appear, allowing you to set whether this should be the default option for all Agreements & Reservations. When the first option is enabled, a new checkbox will appear on the Transactions tab of all Agreements and Reservations, allowing you to mark said Agreement or Reservation as Tax Exempt. Also in the Tax Settings section, you can set whether all of your items (rental prices, merchandise items, etc) have been entered into the system as 'Tax exclusive'; if so, check this box and tax will be added to all items upon selling as the rate specified below. Also within this section ,you can enter the companies Tax Number (known as an ABN / VAT number in some countries), Default tax rate, New tax rate (if your countries tax rate is set to change) and the Date at which the new tax rate is to be applied from. In the Arrears Settings section, you can set whether you want Storman to Reset the late-cycle once the customer has ran over the notice plan triggers. You have an option for Yes, No or to Ask during Daily Processing. It also gives you the option to accept resetting late cycle on receipt of a Customer's part-payment meeting the Minimum balance for arrears and whether you want the Late Cycle to be Reset only when an account is paid. Finally, you can also set whether the Late Cycle should be reset on rent owing, which is where Storman checks the rent owing rather than the full Agreement balance when determining whether to reset the late cycle. Also in the Arrears Settings section, you can set the Maximum number of waived late fees you allow per Customer. You can track the number of waived late fees for any number of months using the field provided. Lastly, the Manual tracking of delinquents on move out option, when enabled, will check if the Customer was on the last two Notices of the late cycle. If they were, then it will prompt then user if they wish to mark this Customer as delinquent. Furthermore, if you try and move-in a Customer (whose details match a delinquent Customer), you can set Storman to deny the move-in, ask the user what to do, or just warn the user and continue regardless. Additionally, if you use Storman Central, the delinquents system will also check other facilities within your group to ensure the same late-paying Customer isn't merely trying to rent at another facility within your group of companies.